Nissan Future Value is a tailored finance solution that lets you keep your options open at the end of your loan term. The key difference with Nissan Future Value is that you can take comfort in knowing up front how much your QASHQAI will be worth to Nissan at the end of your loan term*. Which means whether you upgrade, retain or return your vehicle, you can rest assured that your future is sorted. 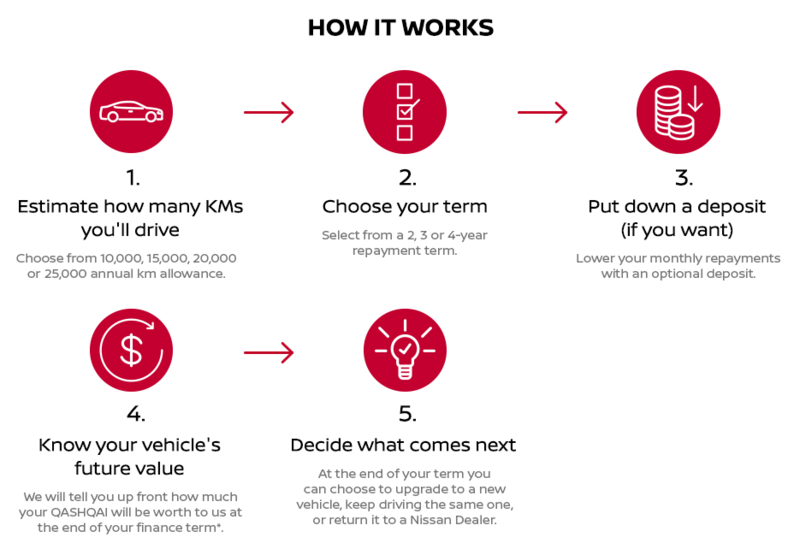 With customised repayments based on your finance preferences^ and annual kilometre allowance, Nissan Future Value gives you the flexibility to make your next move with confidence. Upgrade to a new Nissan and use the trade-in amount to pay off your loan. If the trade-in valuation is higher than the Nissan Future Value, you can put the balance towards your new Nissan. If you want to retain ownership of your Nissan vehicle at the end of your contract, simply refinance or pay out the Nissan Future Value. You can choose to return your vehicle to your Nissan Dealer. Provided the vehicle meets our vehicle condition guidelines and the kilometre allowance has been met, you have no further obligations. Access our vehicle condition guidelines below, or learn more about the Nissan Future Value program by reading through our Frequently Asked Questions. *Under the Nissan Future Value (NFV) program, you can sell the vehicle back to Nissan Financial Services (Australian Credit Licence Number 391464) for the pre-agreed future value (adjusted for excess kilometres and the cost of repairs for vehicle damage beyond fair wear and tear), to pay the final balloon payment on your loan. Allowed kilometres and vehicle condition requirements are set out in the NFV agreement. Terms and conditions apply. ^Nissan Future Value available to approved applicants on QASHQAI ST, ST-L and Ti models, excluding demonstrators over 5,000km or 6 months from date of registration. Information provided on this page is of a general nature only. It does not constitute, nor should it be considered to constitute, legal tax, or financial advice.